A fellow woodworker asked if I had a plan for a folding workbench or work center. I was able to come up with a few and have listed them here. 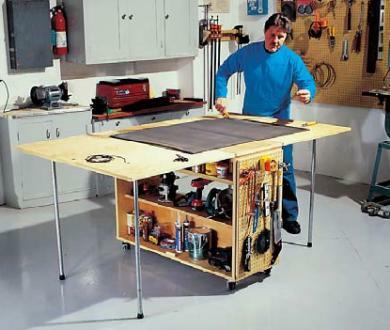 A folding work bench is an ideal solution for a small shop, or for a shop that shares floor space in the garage. The next folding workbench plan is ideal for someone looking for a fixed bench, but needs to make room for other tools. It attaches to your shop wall and folds down to make room. It has a 2 tier design that is quite clever. The final folding workbench plan is almost a combination of the first 2 plans. It attaches to a wall and folds down, yet has ample work surface similar to the first workbench. Good luck with whichever plan you select. Hi – trying to find a link to the plans pictured at the top – but it just links me to family handman website. Do you have an updated link? Thanks! The picture now links to that plan as well. If it ever goes dead again, I kept a print version of the folding workbench plan. Thanks for letting us know that the link was dead. Good luck with your project. Thanks for the nice words. The folding benches are huge space savers and perfect for most garages or shops. Just wanted to say, I subscribe to feed updates for your blog and I really enjoy looking at all the possibilities. This particular design has been my favorite yet, and though I haven’t had the opportunity or space to attempt any of them… I do hope to do so in the future. Thank you for all your free information!